BANGI, 14 Nov 2013 – Malaysia is likely to be warmer and experience higher rainfall throughout this century due to climate change. 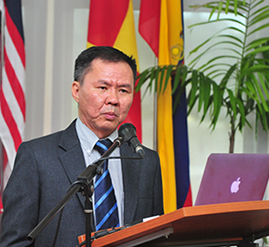 Climatology researcher of The National University of Malaysia (UKM) Prof Dr Fredolin Tangang said the country has so far this year seen a rise in average temperatures and heavier rainfall compared to the same period in previous years. Giving a lecture here today about the key findings of the Fifth Assessment Report by the Inter-Governmental Panel on Climate Change (IPCC), he said the rainfall will be more intense although the frequency might not change much. Prof Fredolin said the average temperature of Malaysia is likely to increase by between 3 to 5 degrees Celsius by the end of the century based on projections. Prof Fredolin, who is Vice-Chairman of the IPCC working group for developing countries, explained that the country’s seas are also becoming warmer and the water level rising because of climate change. He is a Fellow of UKM’s Research Centre for Tropical Climate Change System (IKLIM) of the Faculty of Science and Technology (FST) and the first and only Malaysian elected to the IPCC post. He is also a Fellow of the Academy of Science Malaysia (ASM). Present at the lecture and dialogue session was FST Dean, Prof Dr Shahrim Ahmad and IKLIM Head, Associate Prof Dr Mohd Talib Latif. Prof Fredolin said the IPCC report last year had predicted that extreme weather events such as super typhoon Haiyan – which ravaged and devastated central Philippines earlier this month – could become more common. Super typhoon Haiyan is acknowledged as the worst ever since records began. He cautioned against complacency by Malaysians who might think that typhoons don’t occur here. What is of concern is that tropical cyclones are common in the Philippines, Vietnam and southern China. These nations are important to Malaysia because we import essential items such as rice from them. Any natural disaster in those regions could hurt us economically in the long run. The IPCC report, which was authored by 259 researchers from all over the world, had warned that climate change can cause mass human migrations and eventually economic disruptions beyond the borders of the affected nations. Prof Fredolin explained that IPCC agreed unequivocally that climate change is not just a cyclical event but caused by human activities. The rise in the use of fossil fuel is increasing the global levels of carbon dioxide and thus causing global warming. Climate change, he said, doesn’t necessarily mean that all regions experience higher temperatures. What happens is that wet regions become wetter and arid areas become drier such as increasing desertification in sub-Saharan Africa. Also the so-called temperate nations may experience colder winters and warmer summers. The IPCC is a scientific intergovernmental body set up at the request of member governments. It was first established in 1988 by the United Nations to provide comprehensive scientific assessments of current scientific, technical and socio-economic information worldwide about the risk of climate change caused by human activities.